Generally speaking, there probably isn't much that public health professionals and the food industry agree upon when it comes to Canada's imminent new Food Guide. Briefly, public health would like to see the Guide discouraging the consumption of sugar sweetened beverages, ultra-processed foods, processed meats, trans-fats, and see a swap recommended so that people are encouraged to replace their saturated fats with unsaturated fats. Public health would also like to see the Guide discourage frequent use of restaurants, encourage cooking, and promote the free-from-distractions consumption of those cooked meals, ideally with loved ones, on a regular basis. There's more, but that's the basic gist. The food industry would like to see the Guide avoid the discouragement of any particular food, would like to see dairy maintaining its undeserved separate food category while simultaneously not admonishing against chocolate milk, saturated fat swaps, and would like soft, ambiguous language around processed foods and more. But there is one area where public health and the food industry wholeheartedly agree - they both agree that the Guide matters a great deal and it wields real influence on the eating patterns of Canadians. No, Canadians don't shop with the Guide in hand, but industry relies on the Guide's messages in their marketing and sales. For instance, if the Guide, as drafts suggest, has indeed eliminated the dairy category and rightly lumped dairy in with other sources of protein, the dairy industry may no longer be able to suggest to kids (even kindergartners), parents, educators and more that we need a particular number of servings of dairy per day. This in turn, along with the removal of chocolate milk as a dairy equivalent, will likely, over time, affect school milk programs, and will certainly impact the "dairy educators" that schools bring in to chat with students. It will also preclude the dairy industry's ability to buy skewed surveys designed to provide a veneer of health to their products, to launch apps to ensure you're having enough, and when articles are written about dairy in the media, no longer will there be a throw away line included about how many servings the Guide recommends daily. And all of that will undoubtedly affect dairy sales. Which of course is why the dairy industry has mounted a years long campaign to try to prevent changes to the Guide's dairy recommendations. They've sent in letters to Health Canada and ministers, they've seeded the media with interviews and concerns, and they've even created an astroturf front group called "Keep Canadians Healthy" that pushed Facebook ads to the public encouraging them to be concern and upset about the plans to downgrade dairy, and provided the public with a call to action and a fill in the blank form to mail their MPs (scroll down through the link to see). 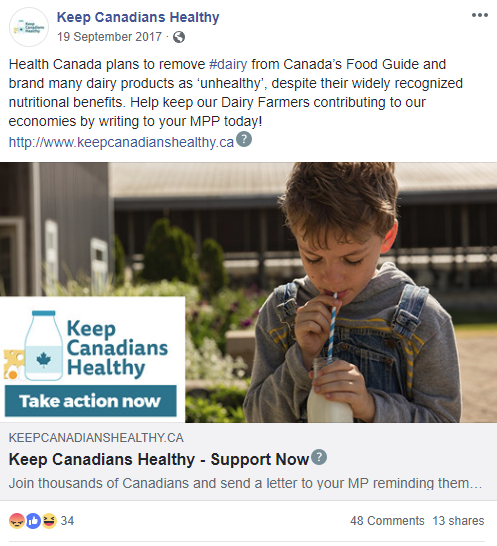 So the next time you hear someone cluelessly (or insidiously) suggesting that the Guide doesn't matter (like the feckless Canadian Taxpayers Federation did on CBC's The National two days ago for instance), remember that pretty much the only area where public health and the food industry fully agree in regards to the Guide is the fact that it matters a great deal to what Canadians buy, and consequently, to what Canadians eat.